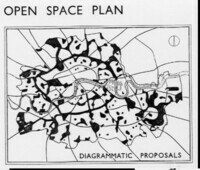 The open space proposals in the 1943/44 London plans constitute one of the most brilliant open space plans ever prepared for a capital city. 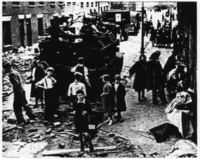 They were written as the bombs dropped on London, apparently creating opportunities for new open spaces (Fig. 3). The two documents which contain the plan are often described as ‘the Abercrombie Plan’. They were the County of London Plan and the Greater London Plan. There is no doubting the predominant influence of Professor (later Sir) Patrick Abercrombie. He was a Past President of the Town Planning Institute, a member of the Institute of Landscape Architects and a fellow of the Royal Institute of British Architects. He looked beyond the narrow concerns of the NPFA. Abercrombie’s open space plan modified the dominant ideas of the 1929 plan and linked them to a visionary planning concept of the highest order: the creation of a coordinated Park System for the Region of Greater London. There was also great richness in the detailed comment and recommendations which support the plan. Abercrombie began with the statement that ‘Adequate open space for both recreation and rest is a vital factor in maintaining and improving the health of the people’. Precise calculations were made and it was found that the area of open space varied from 2.43 ha (six acres)/1 000 in Woolwich to 0.04 ha (0.1 acres)/1000 in Shoreditch. This 60-fold disparity led Abercrombie to propose ‘Standards of Open Space’. He believed that ‘1.62 ha (four acres) per 1000 population’ was a reasonable figure to adopt and explained that: ‘This is considerably below the 2.83 (7 acres) suggested by many competent authorities, both in this and other countries, but it is put forward in view of the already highly developed use of the land in these areas’. His form of words left readers with the feeling that it would be miserly in the extreme to mention a lower figure. Abercrombie explained the Park System concept (Fig.) as follows: ‘All forms of open space need to be considered as a whole, and to be co-ordinated into a closely-linked park system, with parkways along existing and new roads forming the links between the larger parks.’ His objective was extensive and magnificent: ‘it becomes possible for the town dweller to get from doorstep to open country through an easy flow of open space from garden to park, from park to parkway, from parkway to green wedge and from green wedge to Green Belt . . . A great advantage of the linking parkway is that it extends the radius of influence of the larger open spaces and brings the latter into more intimate relationship with the surrounding areas.’ Abercrombie defined the connecting links in the system as ‘parkways’ and placed them in seven categories: linear strips of open space; riverside walks; footpaths through farmland; bridle tracks and green lanes; bicycle tracks; motor parkways; express arterial roads. The last two categories are now surprising. They date from the time when driving a horseless carriage through a park or along a tree- lined street was a recreational activity. The original, American, use of the term ‘parkway’ was to describe routes of this type. Many of the links between open spaces shown on the Abercrombie open space plan, especially those within the London County Council (LCC) area, were of this type. As vehicular traffic increased, especially after the Second World War, urban ‘motoring ceased to be a pleasure. Few now see tree-lined roads as potential links in an open space system. Amercrombie's most developed parkway was for the Lee Valley in North East London. A special Act of Parliament (in 1968) gave powers for the creation of the Lee Valley Regional Park Authority. It continues to levy a tax on all Londoners, despite the fact that almost all the Park's visitors are from the local area. shows both the opportunity for making new parks and their potential users.